The people of Thailand have spent Friday mourning King Bhumibol Adulyadej after the world’s longest-reigning monarch died on Thursday. Crowds gathered early in Bangkok to watch a royal convoy move slowly through the capital’s ancient district to the Grand Palace. Many people were dressed in black and carried portraits of the king. Although the monarch had been in poor health for years, many saw him as a father-figure who stabilised the country through decades of coups, political turmoil and civil unrest. “I have given my services to the king in the past, so it was necessary for me to be here. I want to be here and I am happy, even if I have been here since the early morning,” said one man, Sayan Gidganjaradwong. “I feel like it was a good chance for me to see him for the final time. I won’t ever forget this, I feel as if all Thais feel the same way as me. The king was like a father, it feels like my father has died,” Nantiya Thaiboonrueng added, choking back tears as she spoke. People in Thailand mourn their king after the announcement of his death. Buddhist monks chanted prayers at the Grand Palace. A traditional royal cremation is expected but no date has been set. Queues had begun forming early outside the palace where people took part in a ritual cleansing process to mourn the monarch. 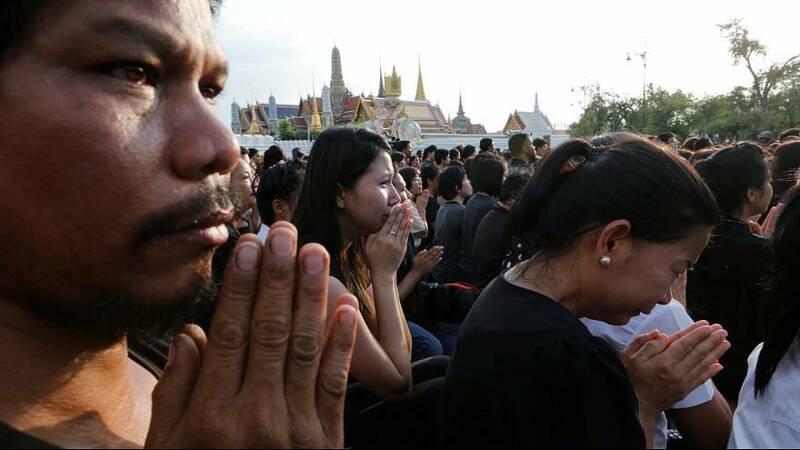 Some of those who had gathered outside the hospital where the 88-year-old king died broke down in tears. Thailand’s cabinet declared Friday a government holiday, and flags will fly at half-mast for 30 days. The government has also asked for people to wear black, and avoid “joyful events” during this period. Many Thais worry about a future without the king. The military which took power in a coup in 2014 has long used defending the monarchy to justify its intervention in politics. The heir apparent, Crown Prince Maha Vajiralongkorn, 64, who is far less liked, wants to leave the formal succession until later. In 2010, a leaked US diplomatic cable showed members of the Thai privy council discussing their concerns about the crown prince.